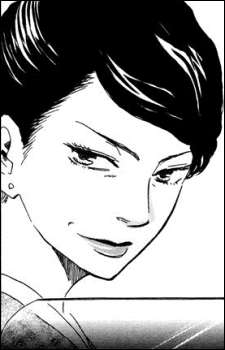 Aki's mother and the fearsome head of the Kirishima group. Aki lived with the Kirishima family until the age of 10, after which the Kirishima family has only gotten to see Aki once or twice a year. Despite this, Aki and Miyabi always quarrel, Miyabi often disciplining her son with violence. All of her underlings are very much in love with her "idiot son", though. Miyabi is, in Aki's words, a wafuku maniac, meaning that she loves traditional Japanese clothes above all and requires everyone to dress traditionally at the Kirishima family home. She is cunning while her husband is more honorable but they make a powerful couple.